As to Chinese saying there are seven basic daily necessities as fuel, rice, oil, salt, soya sauce, vinegar, and tea.. The finest tea in China is grown at altitudes of 910 to 2,124 meters. People often use spring water, rain and snow water to make their tea. Chinese think that green tea is the best when prepared in glass tea ware. Scented tea isthe best in porcelain ware while Oolong tea should be prepared in purple clay tea ware. Most popular wares is one from the Yixing (Jiangsu province - east coast of China) and Jingdezhen (Jiangxi province - southern China). Tea wares consist of mainly teapots, cups, tea bowls and trays etc. Each guest in Chinese homes is immediatelly served with a cup of tea. It is a symbol of togetherness, a sharing of something enjoyable, a way of showing respect to visitors. Guest shouldtake at least a sip. Refusing cup of tea might be treated as rude. A host, when pouring tea, won't fill guest's cup completely. The tea will make seven tenth of cup. The rest three tenth will be filled with friendship and affection. Person drinking his or her cup of tea has to empty it in three gulps.In southern China after a person's cup is filled, that person may knock their bent index and middle fingers (or some similar variety of finger tapping) on the table to express gratitude to the person who served the tea.The younger generation always shows its respect to the older generation by offering a cup of tea. Going to restaurants and drinking tea, therefore, becomes an important activity for family gatherings.In Chinese culture, people make serious apologies to others by pouring tea on them. That is a sign of regret and submission.In the traditional Chinese marriage ceremony, both the bride and groom kneel in front of their parents and serve them tea. That is a way to express their gratitude. In front of their parents, it is a practicefor the married couple to say, "Thanks for bringing us up. Now we are getting married. We owe it all to you." The parents will usually drink a small portion of the tea and then give them a red envelope, which symbolizes good luck. The tea ceremony during weddings also serves as a means for both parties in the wedding to meet with members of the other family.There are hundreds of different Chinese tea. They can be classified in five main groups:green tea, black tea, brick tea, scented tea and Oolong tea.I have already written about green tea, black tea and Oolong tea...So, if interested please find those posts. Scented tea is very popular in northern China. It is a mixture of green tea withrose, jasmine, orchid and plum flower petals. Brick tea is brick shaped green or black tea. Itis mainly produced in Hunan, Hubei, Sichuan, Yunnan and Guangxi Zhuang Autonomous Region.The best ten Chinese teas are: Longjing (Dragon Well), Biluochun, Huangshanmaofeng, Junshan Silver Needle, Qimen Black Tea, Liuan Guapian, Xinyang Maojian, Duyun Maojian, Wuyi Rock Tea and Tieguanyin.There is a saying,"China has the best teahouses in the world and Chengdu has the best teahouses in China." Chengdu is a capital fo Sichuan province in southwest China. Teahouses in Chengdu are places of social gathering, entertainment, chatting. Local teahouses also offer programs of local artists and Sichuan opera. 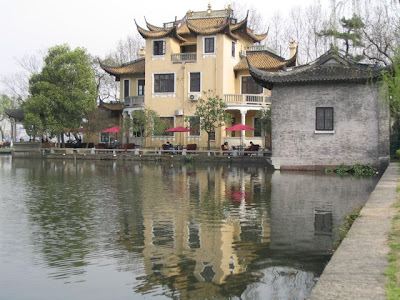 Finally today here is the photo of teahouse on the West Lake (Xi Hu) in eastern China.